MPIC hospitals in Mindanao to install advanced technologies to improve disease detection and treatment. Two private Mindanao hospitals operated by Metro Pacific Hospital Holdings, Inc. (MPHHI), the healthcare unit of conglomerate Metro Pacific Investments, Corp., have recently announced their purchase of advanced medical technologies developed by GE Healthcare — an investment which aims to improve disease detection and treatment in the Philippines’s southernmost island. • Davao Doctors Hospital is the first hospital in the Philippines to offer GE Healthcare’s wide-bore MRI system for enhanced diagnostic capabilities. The facility will also install a high-definition, low dose CT scanner. • West Metro Medical Center to install GE Healthcare’s multi-modality technologies—a CT scanner, fixed and mobile X-ray, surgical C-arm, ultrasound, anesthesia machine and infant warmer — to improve access to quality healthcare services in Zamboanga City. With the need for a comprehensive healthcare system in the country, the demand for quality medical imaging also increases. GE’s first wide-bore MRI system in the country will be available at Davao Doctors Hospital (DDH), one of the largest hospitals in Davao City and considered the most modern medical facility in Mindanao. The Optima MR450w is an innovative imaging system that provides uncompromised image quality, improved workflow and helps to maximize patient comfort. With a wide-bore MRI, technologists can reposition patients less often and cover more anatomy, especially for claustrophobic or larger patients. 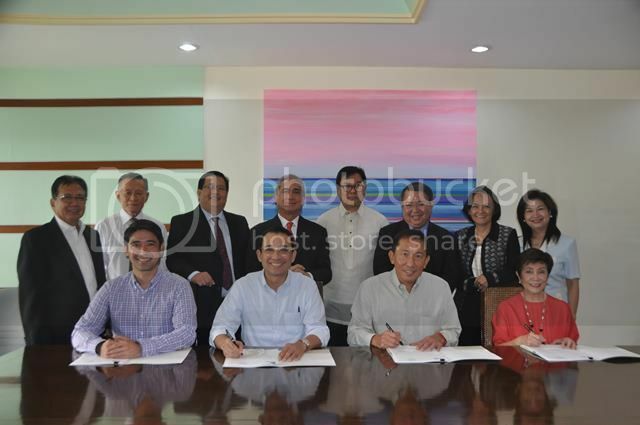 Members of the Board of Directors of Davao Doctors Hospital led by President and CEO Raymund Del Val (seated 3rd from left) during the contract signing with GE Philippines CEO Jocot de Dios (seated 2nd from left) and GE Healthcare Country Manager Ivan Arota (seated 1st from left). 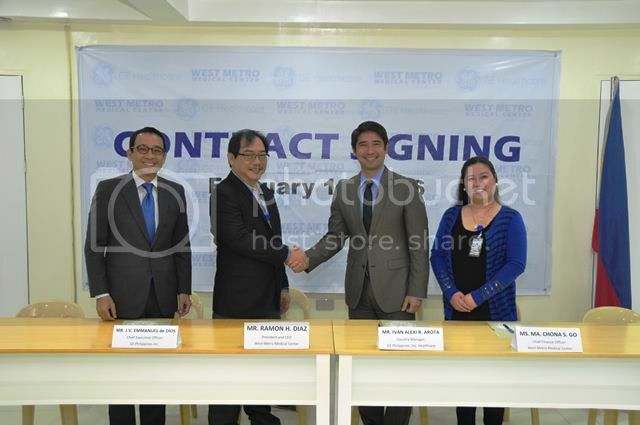 Metro Pacific Hospital Holdings, Inc. President and CEO Augusto Palisoc, Jr. (standing 4th from left) was also present during the contract signing. Aside from the Optima MR450w, the 250-bed hospital will also be home to GE’s Discovery NM/CT 670 Pro in the country. This CT technology is designed to enable physicians to perform advanced hybrid and standalone CT procedures, delivering excellent imaging performance at low dosage and reduced scanning times. About 400 km from Davao, the West Metro Medical Center in Zamboanga City will install GE’s wide-range of multi-modality equipment which includes a CT scanner, fixed and mobile X-ray, surgical C-arm, ultrasound, anesthesia machine and infant warmer. The 110-bed health facility is one of the most recent additions to MPHHI’s chain of private hospitals in 2015. (From L to R): Jocot de Dios, CEO, GE Philippines; Ramon Diaz, President and CEO, West Metro; Ivan Arota, Country Manager, GE Healthcare; Maria Chona Go, Chief Finance Officer, West Metro. Metro Pacific Investments Corporation (PSE: MPI) a leading infrastructure holding company in the Philippines. MPIC’s intention is to maintain and continue to develop a diverse set of infrastructure assets through its investments in water utilities, toll roads, electricity distribution, hospital operations and light rail. MPIC is therefore committed to investing through acquisitions and strategic partnerships in prime infrastructure assets with the potential to provide synergies with its existing operations. Metro Pacific Hospital Holdings, Inc. is the hospital investment arm of MPIC, the largest private operator of hospitals in the Philippines.